We recently discussed what you need to know before booking your wedding venue, and now we’re going to chat more about what to do AFTER you’ve booked your venue! Kelly of Kelly Kennedy Weddings and Events is joining us today to share her expert insight, and we can’t wait for you to learn from her! You’ve just booked your dream wedding venue. Congratulations! I bet you are on cloud 9 and daydreaming about how your venue will look after you’ve added your own personal touches. You probably can’t stop thinking about how perfect it will be when you and your fiancé – I mean, husband – are dancing your first dance in the middle of all your wedding guests. Am I right? This step is what makes it real for many couples, and I’m sure you are anxious to get moving on to the next steps in wedding planning. So, what are the next steps after you’ve booked your wedding venue? 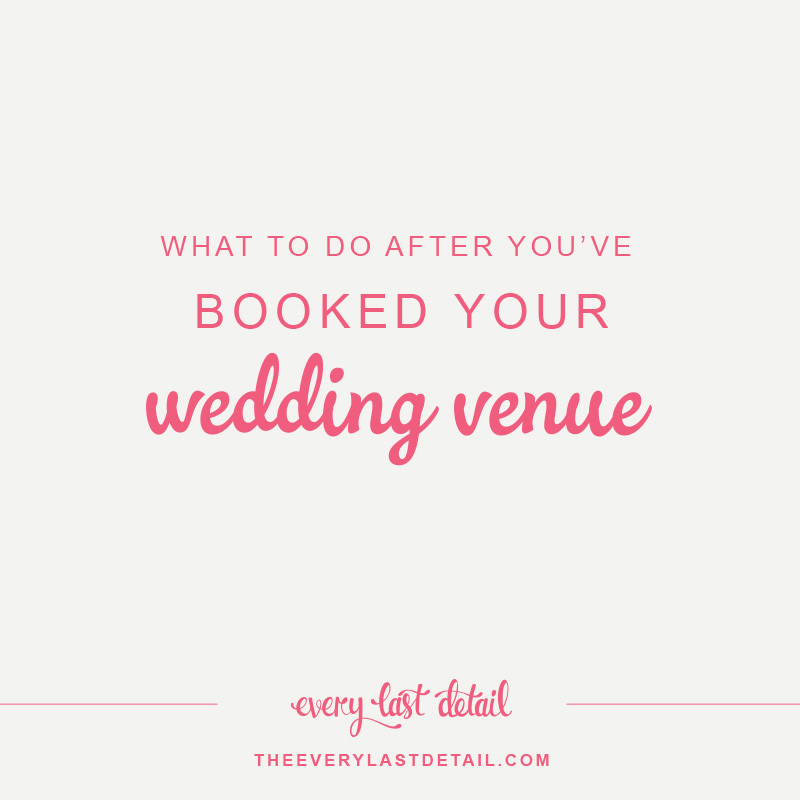 Booking your venue should be at the top of your wedding planning to-do; but now that you’ve checked this one off the list, what the heck are you supposed to do next? Well, to be honest, there are a ton of different directions you can go. The opportunities seem endless, and it’s very common for a newly engaged couple to feel overwhelmed with the wedding planning process or what they should be doing next. The best advice I can give to any couple is to hire a wedding planner (if you haven’t done so already). And I’m not just saying that because it’s my profession and passion! A full-service planner can add so much value to the process, because the best ones are sticklers for details. They have a keen sense of time management and will keep you on task in the months, weeks and days leading up to your big day. As a planner, one of the most important questions I ask my couples before we even review vendor proposals is, “What are the three most important elements of the wedding to you?” Some couples want amazing food, others prefer to focus on the décor, and some prioritize their guests’ experiences over their own. I will ask the couple to individually write down their choices, and then we discuss. Sometimes the important elements mirror each other for the couple, and sometimes they vary. I truly believe this should be discussed before jumping in to everything else, because knowing what is important to the couple guides us with budgeting and pinpointing their perfect vendor match. For example, if the couple agrees that having an amazing photographer is high on the list, that’s one of the first vendors we will book. The most popular and experienced photographers are booked early – sometimes even more than a year in advance. Another important topic of conversation is if the venue provides food and beverage. That’s great if it’s an option – you’ve just checked off another to-do by eliminating the process of finding a caterer. But, if your venue does not provide the food and beverage, then that should rank at the top of your list. I recommend securing quotes from at least three different caterers to compare costs. This is something that your planner can do because they have the experience in knowing what questions to ask and what is realistic for what the couple wants. The catering bill is typically one of the highest percentages on your overall wedding budget, so this needs to be done quickly after booking your venue in order to help determine how much of your total budget is available for other facets of the wedding. Another expense that can be costly is tables and linens. For venues that don’t provide them, the cost involved in renting those items can take a substantial bite out of your budget, so just be prepared for that. There are a number of other important – and fun – decisions to make in the process, but selecting a venue, determining your priorities, and booking your important vendors can go a long way toward setting yourself up for a smooth and successful wedding.